Here are some of the Friday images from the 2017 con. We strolled the vendors area, gaming, registration, halls before the ball, and stopped for a panel dubbed a "fireside" camp by Kristen McGuire. 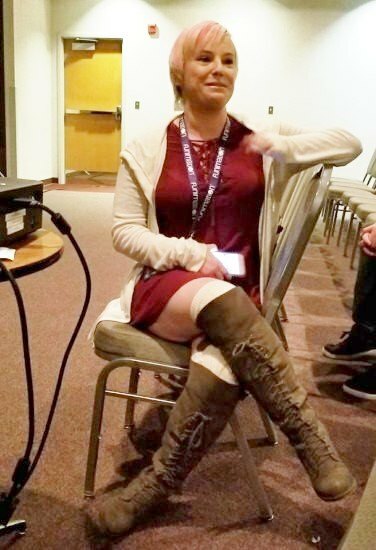 She felt comfortable drawing the attendees together which created an intimate discussion and Q and A.
McGuire, a self admitted fast talking and easy going artist/voice actor/director , sat with the group and added lots of wit to her discussion of breaking into voice acting. Huntington cosplay model Bunny Bombshell debuted a new Sailor Moon cosplay.